Forza's booth babe. Does she have a license to drive? Some conventions ban booth babes because they show toooo much breast or toooo much cleavage or leave nottthhinnng to the imagination. Not the E3 expo, where booth babes and their lack of clothes are considered as much as part of the furniture as a Halo announcement. Here's some pictures of said booth babes as spied from around the internets... is this the top ten? What do you think? Too much time at the tanning salon? I think she's missing a lollipop? Want more? 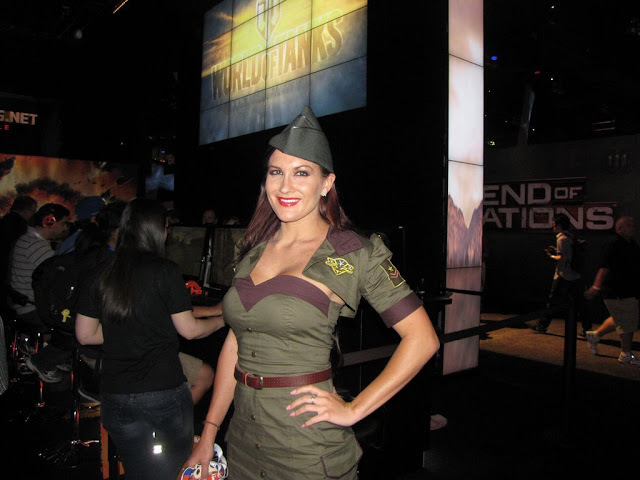 Okay, here's last year's E3 booth babes.